This entry was posted on March 13, 2011 at 5:53 pm and is filed under Uncategorized. You can follow any responses to this entry through the RSS 2.0 feed. Both comments and pings are currently closed. The idea of Howard pre-arranging to have everyone in as stooges just to get Sheldon mad is priceless! Admittedly, I didn’t get it until the lunchroom trick, but I’m glad that reveal was there. So Penny’s guess to Howard was more acting? Fridge brilliance. Actually, the Brits use the word “billion” for 10^9, just like the Americans, and have been doing so since 1974. Also, in most countries where “billion” does mean 10^12, the word for 10^9 is not “thousand million”, which unarguably is quite a silly term, but “milliard”. Finally, there’s no other word for 10^68 in English. Since in long scale (the system your comment about the Brits was actually aimed at) each new term greater than 10^18 is 10^6 times larger than the previous (not 10^3 like in short scale), the closest term would be “undecillion”, which is 10^66. So the number of ways to shuffle a deck of cards would be called “eight hundred undecillions”. Actually, there’s no word for 10^68 in English. “Unvigintillion” is actually 10^66. Further, 52! = 8 * 10^67. Indeed I was off by a factor of 10 for 52 factorial. Thank you, I have fixed it and the name of the number. As for what the British traditionally called large numbers, I took that from wikipedia here: http://en.wikipedia.org/wiki/Names_of_large_numbers . They say “thousand million” is traditional British for billion whereas “millard” is continental European. The number name I use, “80 unvigintillion” is in the column for US and modern British. I’ve added a link to long and short scales for the interested reader. While the British have made the change to short scale, it is not universal. See http://en.wikipedia.org/wiki/Long_and_short_scales#Long_scale_countries . Fair enough. Though if you look at the table in the “Names of large numbers” article you link to, you’ll see that the traditional British method is actually perfectly consistent. It uses the exact same terms as the US method, but simply spaces them out a bit more (hence “long scale”) – every sixth power of ten is a new term with the -illion suffix, and every third power of ten between those is prefixed with “thousand”. The continental European method is only slightly different by changing the -illion suffix to -illiard instead. A million isn’t called “thousand thousand” because there’s no need – the word “million” already exists. And “billion” isn’t skipped over, it’s simply the next term after “thousand million”. Even if it seems a bit confusing at first, this is nowhere as big of a mess as the imperial system where the relations between different units are pretty much arbitrary. Yeah, I think you’re unfairly dismissive of the long scale–if anything, it’s simpler to use 10^(6n) than 10^(3(n+1)). Why do you add +1? The short scale just counts factors of 10^3, with the first one being thousands, the next being millions etc. The long scale has the extra complication of not just 10^6 counts for word increments but also with epicycles of 10^3 within it. OK, I get the +1 now based on the comments…it is because the prefixes have meaning. I buy it. Perhaps someone should start a facebook campaign to go back to the long scale. Oh, I see…for counting prefixes. True that. The logic behind the long scale is simple – it just counts the powers of a million (10^6) which is the first term named -llion. Thus, a million squared is a bi-llion, third power a tri-llion and so forth. Based on this logic, it’s a matter of taste whether you like the “thousand” prefix or the -lliard suffix. My taste favours -lliard – but that may be a cultural bias. An advantage of the long scale is that it’s use of names is a factor two (on the log scale) more economic. Both scales take an infinite number of words to label all numbers, so what’s the economy in saving a factor of two. Sheldon’s analysis was flawed. One look at a library book or even a search on magic would have allowed him to figure out the trick. I know I figured it out first time. I did enjoy his own try at replicating the trick though. A little more work on it and he might have had them fooled. Then again, considering Sheldon is really bad at both lying and acting, he probably could not have fooled them anyway. There’s a typo in Garner’s Cyclic Number trick — “Give your spectator six red cards: 2, 3, 4, 5, and 6.” — that’s 5 cards! Yes, clearly any convention which isn’t American must be “wrong” and therefore logically flawed! But good for the “Brits” eh, they eventually saw sense. Perhaps one day they’ll start driving on the right and stop misspelling the word colour and calling soccer football! There are only 5 tens between 1 and 52 and 5 multiples of 5 that are not tens. But 25 and 50 each provide an additional factor 5. Wow, I was having a bad math day. Thanks. Yeah, those crazy brits for scoffing at the non-use of the metric system when they have only been using the international terminology for the last 36 years! And clearly the way america does stuff is the only “correct” way to do things – others don’t even get “a billlion” correct. Says who? I don´t see any consistency in calling 1.000.000 a million and 1.000.000.000 a billion. Moving it backwards, 1.000 should be a zerollion. 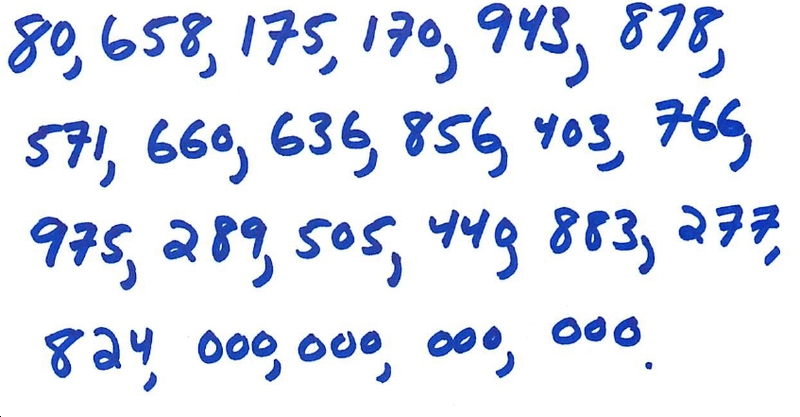 On the othe hand, is perfectly consistent to call 10^12 a billion, because it is a million million. TRIllion is a million million million, and so on. Fine, we´ll keep mum about it, and you guys keep losing NASA probes. No problemo. Wouldn’t it be “nillion” or “nihillion”? Sorry, I meant “I do see an inconsistency” That is a meta-inconsistency, hmm? Stereotypically, knocking the French is an even better sport here than knocking the US, so if only those 19th century Francophile Americans had called it the French billion we would all know who to blame for this confusion. Freedom billions anyone? Dear Malcolm. Thank you for your detailed and thoughtful reply. I was only teasing the British because we love them. If it weren’t for differences like this we might think that UK is just another part of the U.S., like Canada. You have one glass of tea and one of water, both same size. They have n molecules each. The tea cup is filled with red balls, the water with blue ones. After you drink 1 random thing out of the tea cup you replace it with a blue one out of the water cup. You keep going until you run out of water, and then run of tea+water. And this function can but decrease as you increase the amount of tea+water! And if you have enough tea for Sherlock, Spock and Shelley (and maybe a buddy Watson), no one will be surly, so we will surely see: the limit when n is a big number! But who knows what it’ll e^-1? If sums of discrete numbers can describe large amounts of stuff, I just wonder if all the n smaller than 1 or smaller than -1 count for something too! Maybe they all cancel, and so the series and therefore the universe doesn’t diverge. Or maybe we just exclude everything between -1 and 1 (including 1, but not -1!) and so… we have a universe with no center! I want to create a modern board game about The big bang theory and the Science in general. I’m searching help. Do you know how I can get in touch with the admin of the blog? Plugging in n=365 and m=23 for the birthday problem, we get David’s answer of about 0.49 for P(not). But for very large n and m (and n much larger than m) it’s still rather tricky because there are some cancellations between the terms. Once again this gives 0.49 for the birthday problem. For the deck problem, n is much bigger than m and P(not) ~ exp[-m^2/(2n)] is still a good approximation (we can drop the last two terms). Since m^2/n is still much smaller than 1, we can use the approximation exp(1+x) ~ x to get P(not) ~ 1 – m^2/(2n). or just m^2/(2n). For the deck problem this gives about 3×10(-31), still pretty small but much larger than the naive guess of m/n = 9×10^(-50). I loved Howard’s card trick! I received my PhD in mathematics from Duke University on the mathematics of card shuffling – “Permutations by Shuffling and Cutting: A Generalization to Q Dimensions,” and went on to patent a computer memory based on principles first discovered by magicians. (Moving cards in a deck is similar to moving data in a memory.) 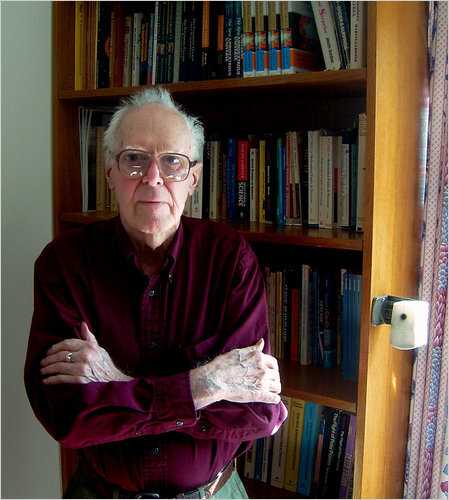 It’s written up in my book published by the Mathematical Association of America, “Magic Tricks, Card Shuffling, and Dynamic Computer Memories.” Martin Gardner wrote the introduction.